I love to make framed signs! When I find all wood frames with the tight corners (that were not photograph sized frames, like 5 x 7, 8 x 10, etc), I usually pick them up. This is a large metal round tray I found at the thrift shop for 99 cents. The tray will be project number 2. My first step on the frames, project number 1, was to brush a coat of black latex paint on the flat side of my bead board paneling board. This is a base coat and it's not really necessary to use an expensive paint. I used Rustoleum Painter's Touch in Satin Black. Next I painted both the frames and bead board pieces with two coats of Rust-Oleum Chalked Paint in Chiffon Cream . I lightly distressed the frames and smoothed the brush strokes on the sign board with 220 grit sandpaper. Now to make some fall/autumn signs. 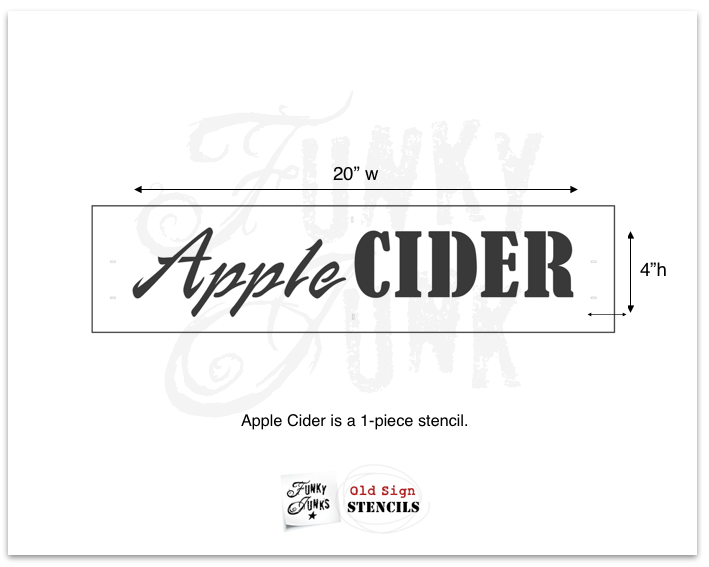 Of course you know, one of my new stencils for fall is Apple Cider from *Old Sign Stencils. I have used this stencil on two recent projects. 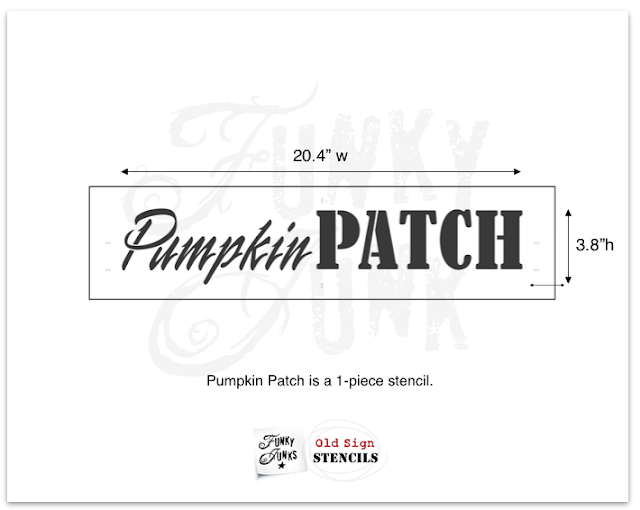 I also have the new Pumpkin Patch stencil from Old Sign Stencils. I haven't used this one yet but I will! 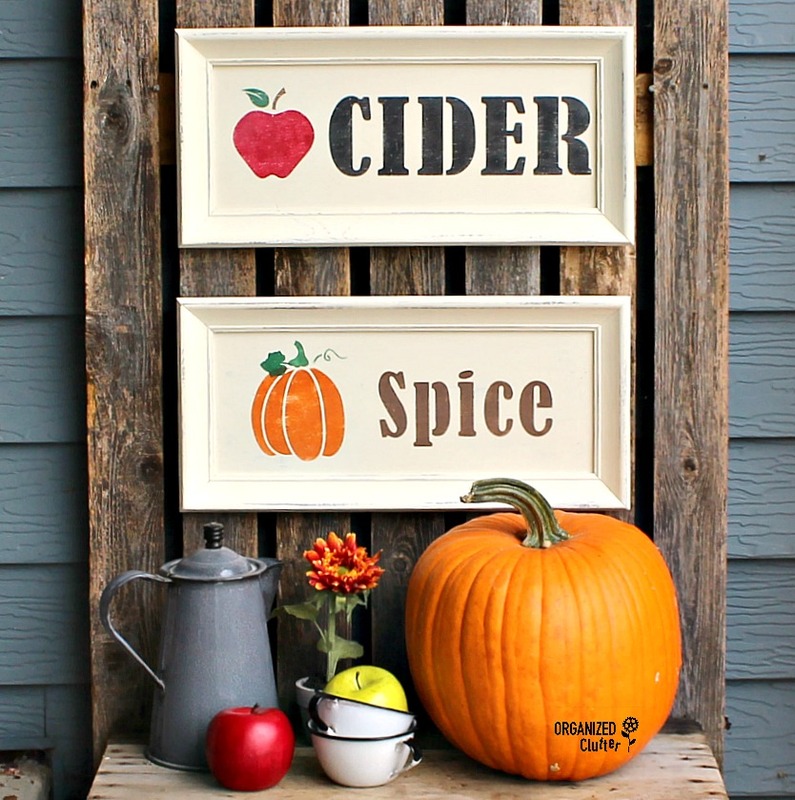 If you click on my link it will take you to Funky Junk Donna's new fall sign ideas. You will love them! 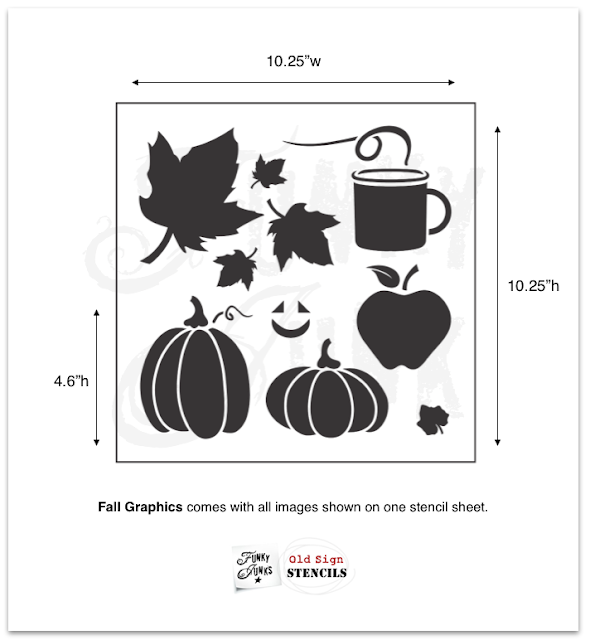 I love this new fall stencil! 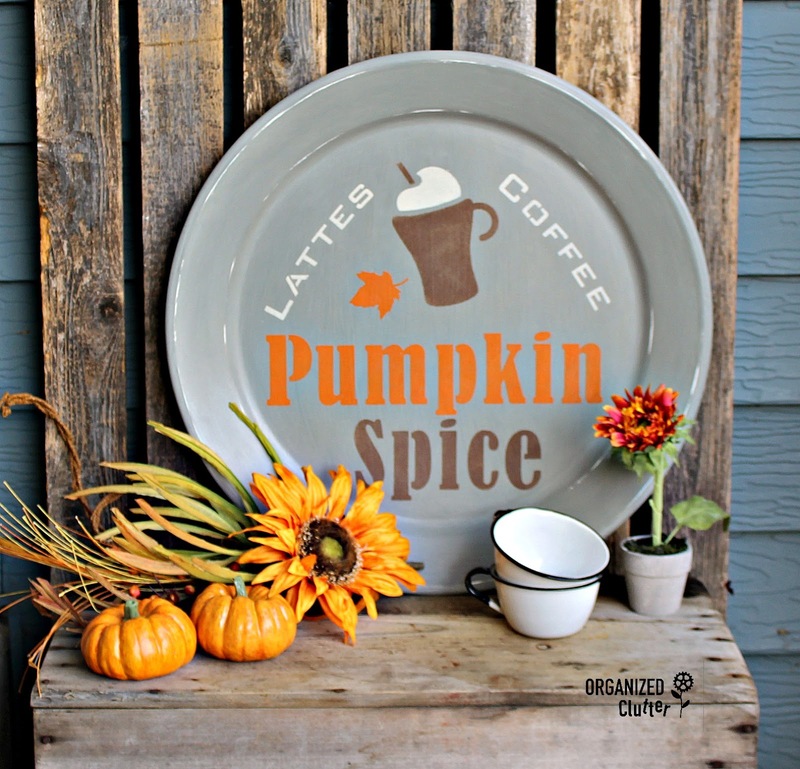 Who doesn't love pumpkin spice? This stencil is available HERE. Old Sign Stencils fall graphics is my last new fall stencil. Now...what to do with my smallish rectangular framed signs all painted up in a creamy white. My plan was to make a pumpkin sign and an apple sign. Even with all the stenciling I have done, my brain isn't always good imagining sizes. 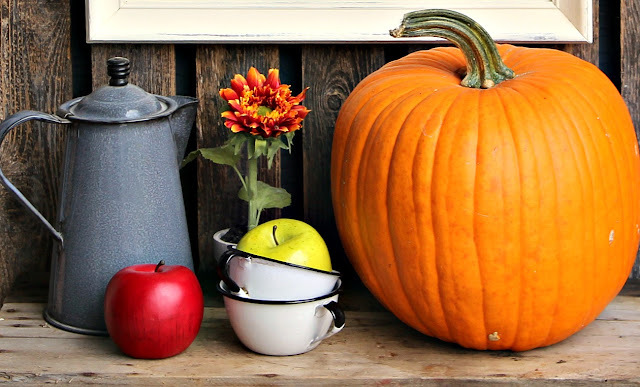 "Apple Cider" and "Pumpkin Patch" were just way too big. Well, how about one of the "pumpkin graphics" along with "Patch". That will work, right? Wrong. Too big. 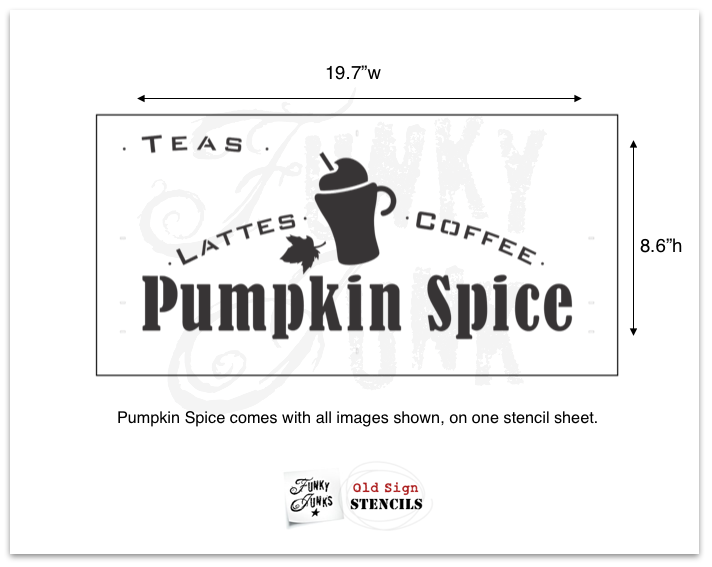 But after measuring and laying the stencils out on my frames, I found that the "pumpkin graphic" and "Spice" from the "Pumpkin Spice Latte" stencil fit one of the frames in project 1. Actually these stencils fit with room to spare. Now to the apple sign plan. Luckily the "apple graphic" and the word cider from the "Apple Cider" stencil fit, but just barely. Now for my stencil paint colors. 1. Deco Art Chalky Finish Paint in Heritage for the pumpkin. 2. Annie Sloan Chalk Paint in Amsterdam Green for the stem. 3. Annie Sloan Chalk Paint In Honfleur for spice. 1. Deco Art Chalky Finish Paint in Rouge for the apple. 2. Annie Sloan Chalk Paint in Amsterdam Green for the leaf. 3. Annie Sloan Chalk Paint In Honfleur for the stem. 4. Dixie Belle Paint in Caviar for cider. Both signs were sealed with Krylon Gallery Series Artist in Satin Finish spray. 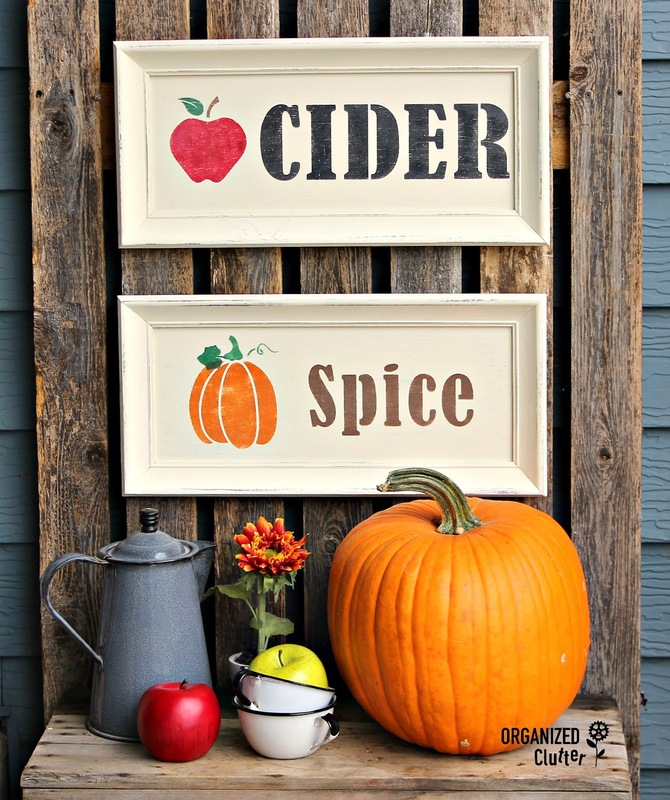 I gathered some of my fun fall props to display my new signs! I am displaying my new signs on an old spring project with a crate and picket fence section. Now to project 2, the metal tray. First, I spray painted it with white spray paint to make the base coat uniform versus the busy dishes pattern. Then, I brushed on a couple coats of Rust-Oleum Chalked in Country Gray . I then, sanded the tray with 220 grit sandpaper, with more pressure on the edges to reveal the white spray paint, and less on the inner parts to smooth out brush strokes. Rustoleum Chalked is also available in Country Gray in spray form. Now to fit this stencil on my tray. Hmm. So Pumpkin fits inside the tray. I stenciled it on with Decoart Chalky Paint in Heritage. 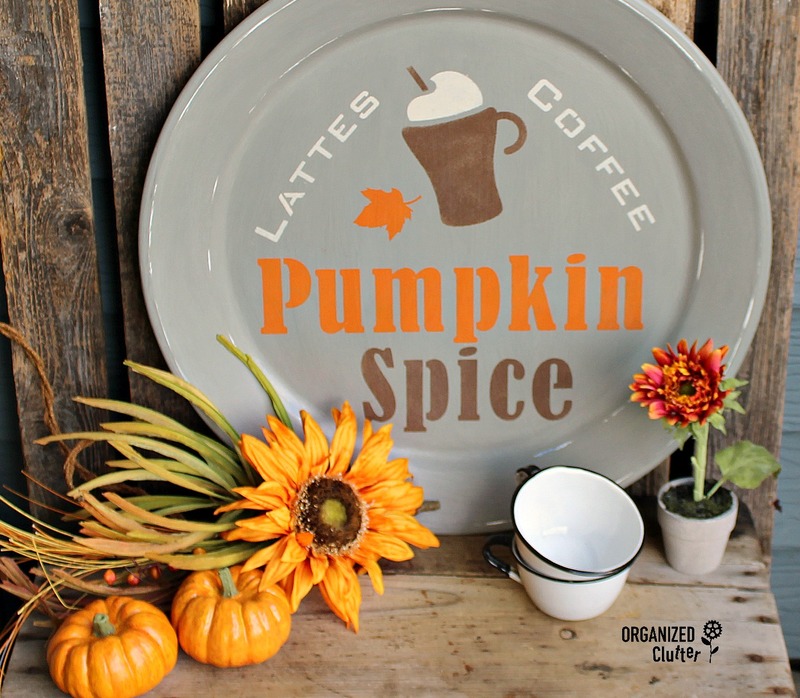 I also stenciled the maple leaf on the pumpkin spice latte stencil with Heritage. 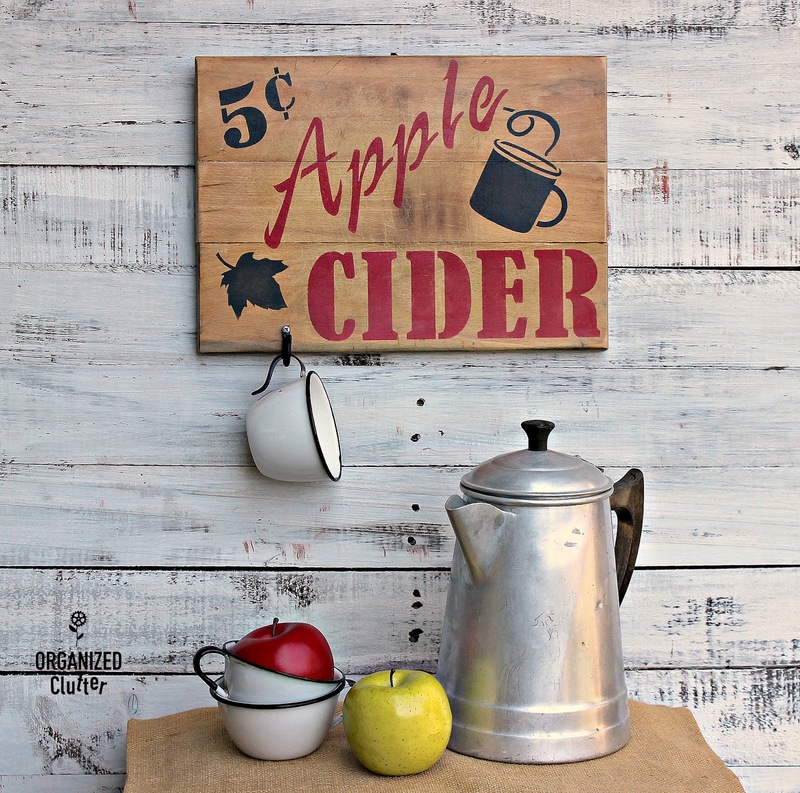 I added "Spice" below with Annie Sloan Chalk Paint in Honfleur, along with the coffe mug and straw graphic. I used Fusion Mineral Paint in Champlain to add "Lattes" and "Coffee". I used the dots on the stencil to get the words even. 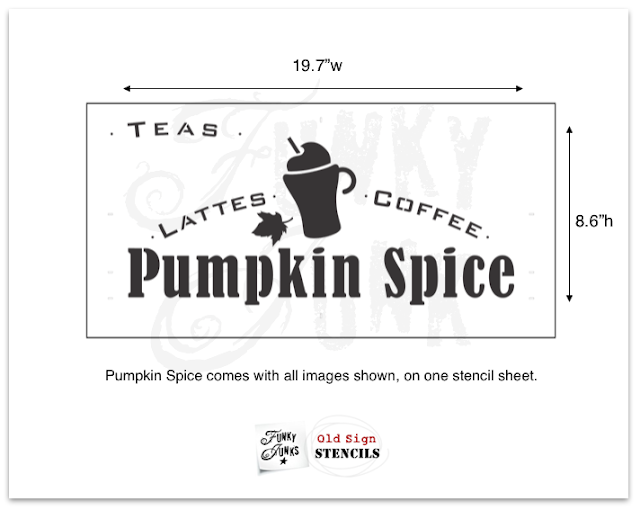 I measured down and across with a ruler on a pencil mark in the dot on "lattes" and put the "coffee" stencil in the same position on the right. BELIEVE me. This takes some practice! I have sanded and repainted, and touched up to get where I am in stenciling. Also stenciling on curved surfaces takes all of your fingers to hold down the stencil at times. But it's worth it! You can transform cheap finds into fun decor! I sealed the Chalked paint and stencils with Minwax Paste Finishing Wax in Natural . Here's the finished tray, Project 2! 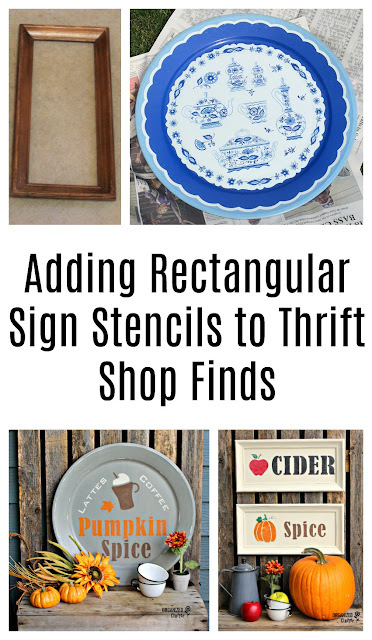 So do you see how to fit a rectangular stencil on a round tray? It does work. Just measure, turn the stencils around. It can be like a puzzle. Expect to fail sometimes. But repaint and try again. *Old Sign Stencils provided me with complimentary samples. All opinions about these fabulous products are my own. A Garage Sale Crate Makeover. 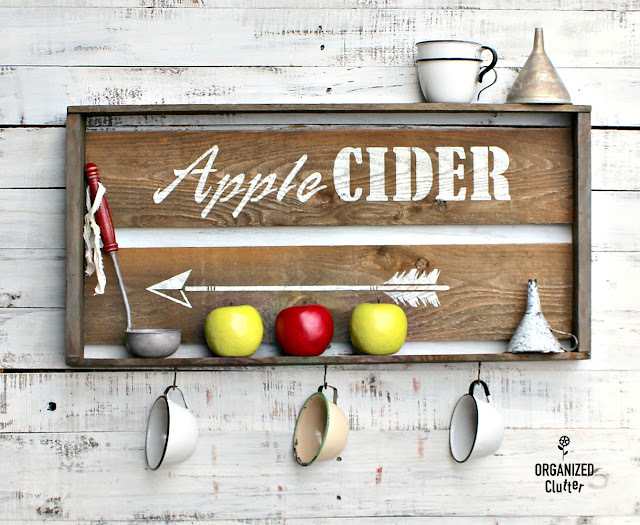 Cutting Board Apple Cider Sign. Super cute Carlene! :) I'll have to find a way dress up my tiny front porch. Thanks for the inspiration! Your play of words on those rectangle signs is simply genius! And the platter a total win! I think I need a platter!